Serious game design usually (at least hopefully) starts from some kind of understanding of the question at hand. In the case of large, human-driven systems like the food system, this understanding often comes from interactions with people with a stake in the sector. Researchers gather nuggets of information from these people and then try to use them to form an understanding of what is going on. The job of a serious games designer is to build a game which packages up this understanding so that people can interact with it easily. As people interact with the game, we can refine the “first-guess” understanding and learn new things. 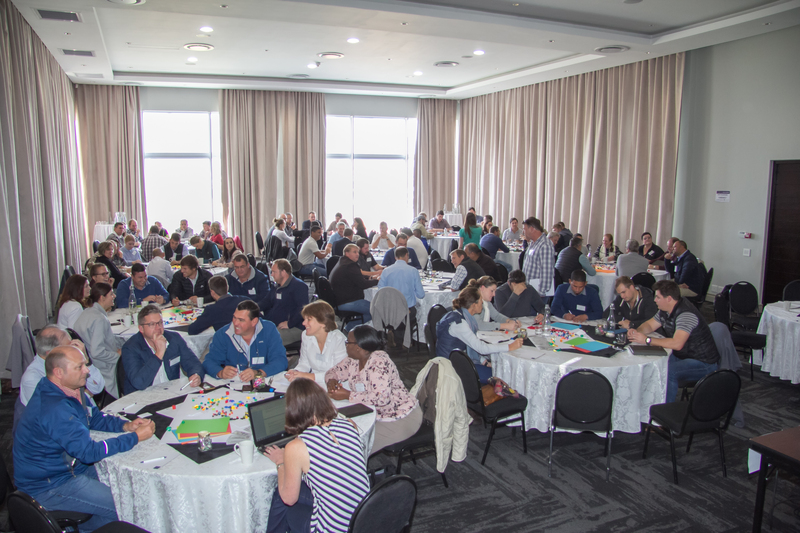 As part of a project looking at the resilience of the UK fresh fruit and vegetable supply, we invited over 100 players in the South African fruit sector (a major exporter to the UK) to workshops where we explored how they see resilience. And this time, we decided to cut out the middleman. Instead of learning from the participants and then going away and making a game ourselves, we gave them a heap of game components and asked them: “If the South African fruit industry was a game, what would it look like?”. 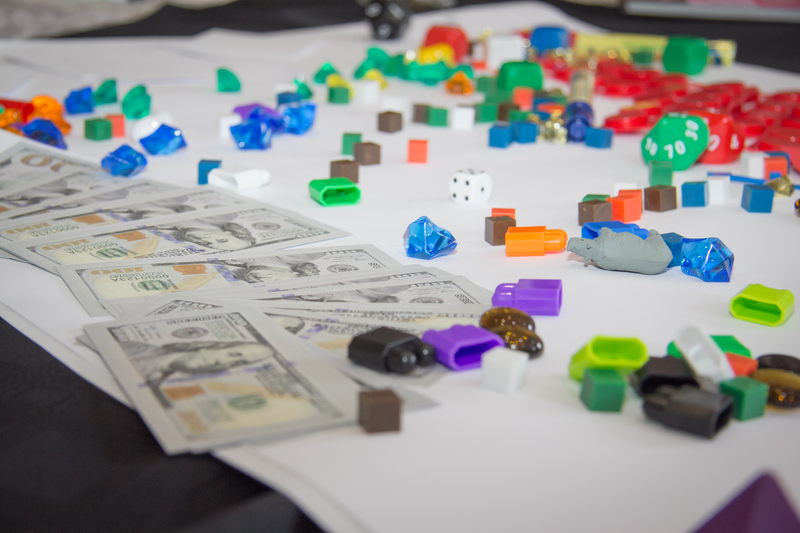 We started with a few exercises with dice and cards to warm up, and then the participants had two hours in groups of 4-8 to design their games. It was amazing to see the fundamental questions that come up in such a fun exercise: what does “winning” look like? Should all players start from a fair starting point? What risks will players be exposed to? How can we fit this plastic rhino into the game? Once the games were designed many of them led to rich discussions. I was surprised by how sophisticated some of the games were: there were mechanisms with competing personal and group objectives and scope for bluffing (and even cheating). What timescales are relevant for fruit sector decision-making? What events are seen as external risks and which are seen as “part of the industry”? This was the first time I’d used game design this way, and I’m really excited about the results. For me, the strength of the method is that it poses deep and important questions in an implicit (and non-threatening) way. It gets at the knowledge we all have floating around in our heads which we don’t usually give voice to, and does so without putting us on the spot. If you’re interested in doing this kind of workshop for your own research, I’d be really interested to hear about it! You can also read more here. This was carried out as part of the project “Increasing resilience to water-related risk in the UK fresh fruit and vegetable system” in collaboration with Bruce Lankford (UEA, UK), Tim Hess (Cranfield University, UK), George Garbutt (Oxford University, UK), and Kate Pringle, Jon McCosh and Mlungisi Shabalala (Institute of Natural Resources, South Africa). The project is funded through the Global Food Security’s Resilience of the UK Food System Programme with support from BBSRC, ESRC, NERC and Scottish Government, and one of the workshops was supported by Worldwide Fruit Ltd. Photos by Jacques van der Burgh.